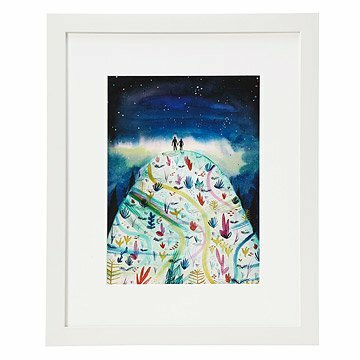 Adrienne Vita imaginative print represents the magical connection between partners in love. Adrienne Vita represents the magical connection between two partners in love in her imaginative print. A hand-holding couple stands on top of a lively hilltop, looking off into a vivid sky, contemplating the path they've traveled together, and picturing the bright future they have ahead of them. Designed, printed and framed in Portland, Oregon. Adrienne Vita is an artist from Portland, Oregon. She creates illustrations in ink, watercolors, acrylics and gouache. She is influenced by her love of the sea, animals and architecture. Her art depicts scenes of unusual environments that are ethereal in nature and all things imaginary. Take a studio tour to see where Adrienne creates her colorful pieces.